LONGMONT, CO (February 26, 2014) – Getting sunburned in childhood or adolescence more than doubles a person's chances of developing melanoma, the most serious form of skin cancer, later in life, according to the National Skin Care Foundation. One of the best ways to protect children from the sun is by covering them up with protective clothing. Eclipse® Sun Products has just introduced their new line of sun protective clothing made especially for babies and kids. The new Kids/Baby Comfy Sun Ponchos are an excellent alternative to slathering on layers of sunscreen, and deliver comfort and optimal coverage from the sun’s harmful UV rays. “Children especially need to be protected from the sun’s UV rays as well as chemicals found in various sunscreens,” says Elise Champe, owner of Eclipse® Sun Products. “Most parents dread having to continuously layer on sunscreen every time their kids go outdoors. Our Kids/Baby Comfy Sun Ponchos are lightweight, comfortable, easy to get on and off, and protect against UV exposure even when wet. There is no other product out there like this,” she says. Optimal Coverage. The children’s poncho effectively covers the head, neck, shoulders, trunk, and arms. On an adult, it covers the chest, shoulder and upper arms for the most protection from harmful rays. Comfortable. No more struggling to remember to apply sunscreen. 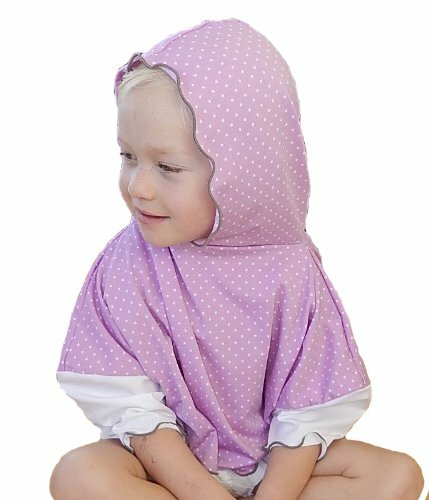 The poncho is light and loose-fitting to keep the hot sun off your child’s skin while not constraining them from playing. Protection. The ponchos provide UPF 50+ sun protection, minimizing the need for chemical sunscreens that may be harmful for some people. “Parents will love the new ponchos for their convenience and protection,” says Champe. “They aren’t tight-fitting and the loose design makes them comfortable, even in the heat,” she says. Eclipse Sun Products, which include sun sleeves and sun gloves, are being used by many people who spend a lot of time outdoors, including golfers, drivers, hikers, and bikers. They are UPF 50+, fashionable, finger-free, and made from patented sun guard fabric. They are made of Spandex to provide a non-slip fit. They also provide moisture wicking and cooling. For more information, visit the site at www.eclipseglove.com. Link to view baby sun poncho: http://groundreport.com/wp-content/uploads/2014/02/polkadotponcho.jpg. More images available upon request. Based in Longmont, Colorado, Eclipse Sun Products creates a line of fashionable sun protection products. The product line includes UPF 50+ sun sleeves and sun gloves. The products, developed by a physical therapist, help outdoor enthusiasts to protect their hands and arms from dangerous sun exposure. They also have kids’ sun protection products, including a sun poncho and sun sleeves. For more information, visit the site at www.eclipseglove.com. We always wear sunscreen, glasses, and hats...have to take care of our skin! I'll check out these products. This is a good alternative to commercial sunscreen. Hope more moms find out about this. It sure is going to be shade time soon, after this long and hard winter I think everyone is ready for some sunshine and to put on your kicking shades. I usually do not burn, but my daughter got an awful looking burn when she was in college. I like have options to slathering on commercial sunscreen.